Once again, Camerata Musica Limburg enchants us with its clear, slender, and yet sonorous sound – for the fourth time with GENUIN! Moreover, this high-class male choir dedicates itself to what is possibly some of the most beautiful literature known: Schubert’s complete all-part songs will be recorded on CD. From the first note of the new series the gates of romantic era are opened wide: vast plains and deep forests… the gentlemen, under the direction of Jan Schumacher, are once again supported by a lineup of illustrious guests: in addition to the Horn Quartet Seidenberg/Sonnen, Christoph Prégardien and Andreas Weller stand out in particular. For over an hour they make blue flowers blossom for us! 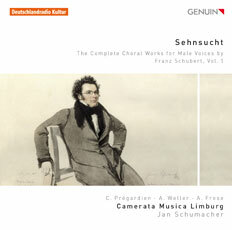 "A collection of choral songs by Franz Schubert, in well balanced, rhetorical performances. Highly recommendable."